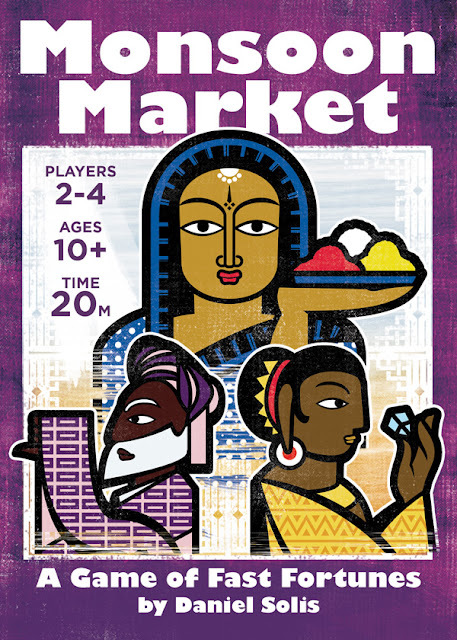 I'm in the process of updating Monsoon Market to make it more suitable for publisher pitches. I still enjoy this little game, but a few wrinkles have shown more prominently over the years of feedback and I am taking this opportunity to smooth them out. Check out the current live rules doc here. There haven't been any changes to the cards themselves, so if you own a POD copy already you're still good. It's mainly procedural tweaks and streamlining. Bonus Goods are spent, no longer permanent. When you spend a good, you note its expenditure by upgrading the Order to silver. Replenish the Market or Orders display at the end of your turn instead of immediately. You only get Bonus Actions if you fulfill an Order at Gold or Silver accuracy. The game ends immediately when someone achieves the point threshold, but you can adjust that threshold for longer games. Hope you get a chance to test these changes at home and offer your feedback! Thanks for your support!